I haven't done much worth posting about. We've done some more cleaning and I got a chance to play some video games with my family. My sleep has been better and yet worse. I know the value of having a constant sleep schedule. I don't thing it works for me, though. I've been waiting until I feel absolutely exhausted to lay down and I manage to fall asleep almost immediately. I don't toss and turn as much. I also don't typically get as much sleep and I'll have some troubles waking up, but once I work through that morning grogginess I have a lot more energy throughout the day. 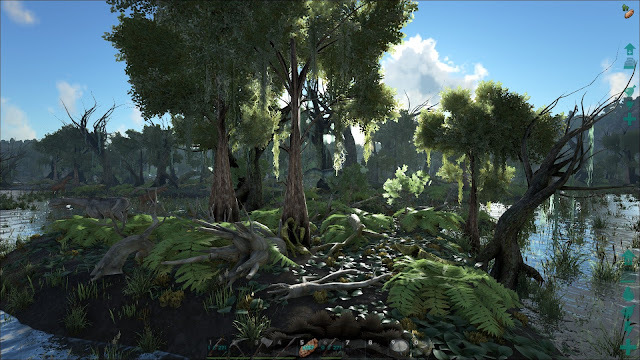 The above picture is another screenshot from that Ark: Survival Evolved game I talk quite a bit about. I tried out a different map for the first time in 1800 hours of playing and I'm absolutely in love. It's so much bigger than the main map for the game and each biome is distinct in its aesthetics and the creatures that can be found. I would not be able to play this map at all on my old computer set up. Ah, I'm such a peach about my new computer set up. I've taken a couple baths in the past few days, but the weather has made it very hard for me to enjoy my baths. It's perfect bathtaking weather but the tub cannot maintain its heat. My baths still last at least 40 minutes, but the bubbles are still out in full force. I like staying until the bubbles go away. Sigh. The landlord came by with an electrician and they fixed the guest room's lack of electricity. The electrician had to completely rewire the electrical box thingymaboppit why can I not remember the name of it? Now when I go to that room I can get electricity and keep the laptop on while working on posts! Yay!! Soapmaking news! Michael and I were talking last night about the lye situation and he took a gander at a Google search. His search not only revealed several websites, but a list of storefronts that are here in Seoul. My search had nothing related to that, only vague blog posts and videos about the process of soapmaking. Turns out it makes a huge difference the website you use. Michael was using google.com/en versus my google.co.kr. Now we have several locations to check out. Also, pricing here is much lower than what I would have to pay in the States based off my quick checks of each location's websites. Now it's just a matter of figuring out if they're willing to sell to foreigners. In any case, soapmaking in Korea has come that much closer to reality for me. Now I need to get Mom to ship me all of my molds and miscellaneous supplies that I left over there but are allowed to be shipped. Yaaaaaaaaaaaaaaay! Immense excitement commence! I'm having trouble finding a warmer for my wax. I have decided that the two warmers I casually use aren't good enough to get a full wax pool. Whether it's a bad translation in electrical differences or the ambient temperature of the house I am having issues getting my wax to fully melt. Even one ounce of wax is too much for these warmers to melt. I have the same owl bulb warmer that I talk about here as well as a hot plate warmer. I've been keeping an eye out for a tealight warmer but so far I haven't had any luck in finding one. Or any warmer, for that matter. Bah humbug. I'll have to look online I guess. So that's my quick update to let you all know that I'm still alive, just not doing a lot of blogworthy things at the moment. I'm trying to melt wax, but I don't feel that my reviews can be fair if my warmers aren't performing to their full potential. Do you guys have any tips from your end of the world on my conundrum? Have you heard of a game called Ablion, or Amblion, or something like that? It's supposed to be coming out soon and is modeled after UO. We're VERY curious about it but our old computers and slow internet probably won't be able to handle it. I'm just not feeling it blog-wise either. My posts would just be me whining about work stuff because that's what's going on these days, and then it would get to where people are rolling their eyes and screaming "THEN LEAVE!" I also had a couple smartass comments recently that got under my skin. So for the moment I'm very much feeling like I don't care if I ever blog again. Even hauls and things, I'm getting impatient with people contacting me to buy things. Um, hello? Did these people not read the posts? Do I come across as saying I made the tarts or candles I feature? Gah! I haven't heard of that game. I've heard of Shroud of the Avatar, which is being developed by Richard Garriot. There's also a game being developed by former UO developers called Shards. Both of these are each developer's take on what made UO such a unique game. I shall have to look into this game you're telling me about, though! Both of the games I mentioned haven't even set a release date. I'm considering doing some form of tag post just to get my writing juices flowing. I'm feeling a bit blah about it right now. You and Julie get all sorts of interesting contact/views information on your blog. My stuff is still lame and vanilla. I don't know if I should be glad or jealous LOL. But I can see how it's very frustrating to have people try and buy stuff without reading what you're actually posting about. Hey, habits aren't bad to have! I've kept myself from posting for a while because there is a bad funk I've been in emotionally and I'm afraid of posting about it. For the most part I want this place to be a happy corner of the internet, but if I'm to make this more into a personal daily blog there's the inevitability of my daily ups and downs coming out in a post. I love your daily life blogs, it's just really interesting for me to see Korea through another perspective! I might not read everyday but I binge through them (like I just did). I am so glad you found some possibilities for lye, I am excited for you to begin your soap-making again and you can bet I will be one of your first customers! :) I have also found it difficult to buy tealight warmers, all of mine have been hand-me-downs from my mother or bought from Australia. If I can find them, they are ridiculously expensive, I don't understand why. I enjoy sharing my life here with you! I'm bad about holding off on commenting/reading until I have a pile of posts and comments to read and reply to. I'm getting really antsy about not knowing when we'll finally get a chance to go to the store! I'm big on making pretty cold process soaps so I want to be able to make my soaps NOW so it'll be ready.... you know, between 4 and 8 weeks from now, depending on what base oils I use. D'oh! I found a few at a local Daiso for under 10,000W but didn't buy because of the lines. I will the next time we go to that store, though.